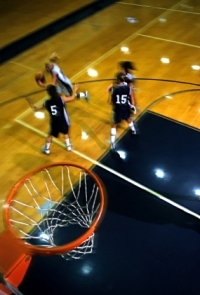 One of my subscribers actually suggested this idea for [tag]girls basketball drills[/tag] recently. I’ve included it for you below. Keep ‘em coming! Most of us have “day” jobs that keep us from focusing on the [tag]basketball drills[/tag] and plays as much as we’d like. I’ve begged borrowed and stole drills and plays for years. I still struggle with the best [tag]basketball plays[/tag] though for grade school girls teams. I’ve coached from K – 8th grade girls and have run numerous plays but still do not feel we’ve found the right one(s). The [tag]basketball drill[/tag] that my teams have really liked is my warm up figure 8 drill. We start them in one corner of the floor have the run forward for half the court, then at mid court they do the defensive shuffle across the court ( we have a coach do passing drills as they slide across), then run up the other half of the court. When they get to the end line they do the defensive slide across the end line, when they get to the next side line the run backward to midcourt where they do the defensive shuffle across mid court where a coach passes the [tag]basketball[/tag] to them again. Then they run backward again to the end line where they do running jumping drill across the end line back to the starting point. A couple times through and they are winded and warmed up. Nothing ground breaking about this drill but my kids have liked it.